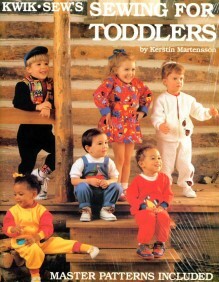 This set of sweet little boys patterns includes pants, jacket, and vest in simple, timeless designs. Toddlers' Pants, Jacket & Vest are designed for medium weight woven fabrics such as suitings, linen, corduroy, denim, or cottons. Pull-on pants have front tucks, and a waistband with elastic. Unlined jacket has patch pockets, the fronts and neckline are finished with facings. The lined vest has a lining back. Includes toddler sizes 1T-4T.